So, you’ve decided to thru-hike a long-distance trail. Fantastic idea! Have you put any thought into what you’re going to eat for all those miles? 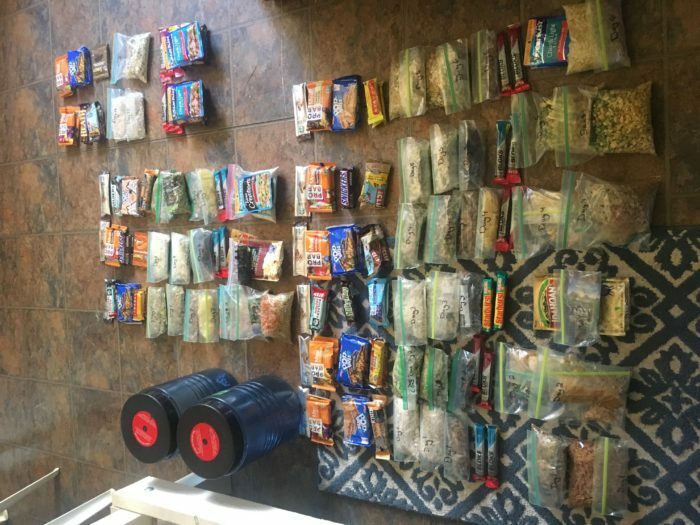 The first decision you need to make is your resupply strategy: are you going to shop as you go, mail packages along the trail, have someone at home send them to you, or a combination? During my 2017 PCT thru-hike I did a combination of shopping in towns along the way, as well as sending packages to a few locations. After a lot of experimentation, and some unfortunate failures, I had a reliable roster of recipes that got me through the miles and left me feeling satisfied. Generally, cooked meals were some sort of combination of a base carbohydrate and an “add-in”, whether a portable protein or veggie. 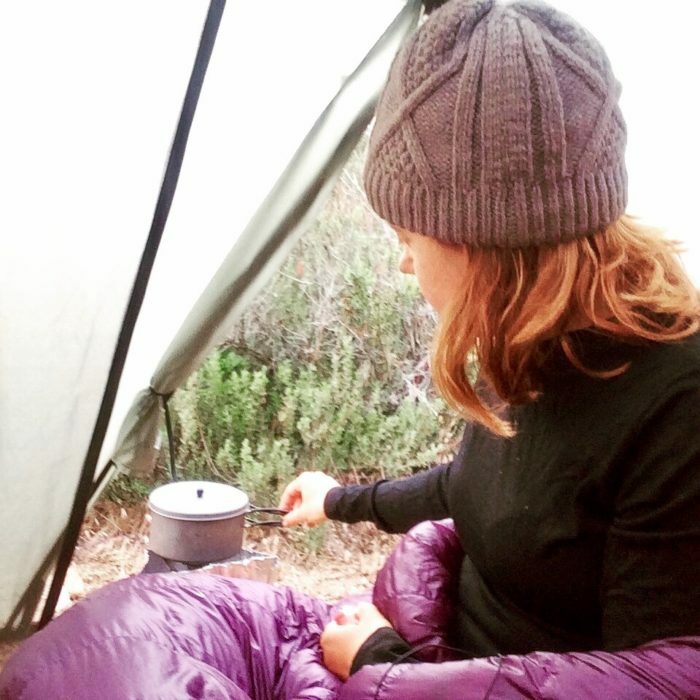 I cooked by bringing the water to a boil, then immediately placing the pot into an insulated cozy, adding the ingredients, and then letting the meal rehydrate. This method saves on both fuel and water. I found that the “Annie’s” brand of mac and cheese cooked better under the “boil and rehydrate” method vs Kraft brand, which formed into an unappetizing glob of noodles. In town: Take a bag of spinach and chop into a fine pieces, then pack tightly into a Ziplock bag squeezing out the excess air. In my experience, the spinach will last for two days on trail. It might get a little wilted by the second day, but not enough to be noticeable when cooked with your meal. I was generally able to borrow a knife and cutting board from hostels, but you could use your Swiss Army knife in a pinch. Empty the mac and cheese into a second Ziplock bag*. On trail: Add the mac and cheese combo into boiling water, and let sit for about 10 minutes, stirring occasionally. Add the chopped spinach, and let sit for another couple of minutes. *Pro Tip: Repackaging into a Ziplock is a good general rule to follow. Rather than carrying items in their original bulky packaging, you save room in your pack and have less trash to pack out of the trail. The amount of seasoning mix that comes in a box of Hamburger Helper can be excessive for the amount of noodles. To alleviate this, I would purchase two boxes of Hamburger Helper and one box of plain pasta, then use one packet of seasoning mix with the two boxes of Hamburger Helper and one packet with the box of pasta. I was travelling with my husband and this would make two meals for the both of us.. Look for pre-sliced pepperoni in the deli section of the store. In town: Portion out the pepperoni into Ziplock bags. Empty the pasta and seasoning packet into another bag. On trail: Add the pasta and seasoning into boiling water, and let sit for about 10 minutes, stirring occasionally. Add the pepperoni, and let sit for another few minutes. Look for the boxes of pre-seasoned couscous, such as the Near East brand. For the tuna, foil packets can be found in grocery stores and even convenience stores. 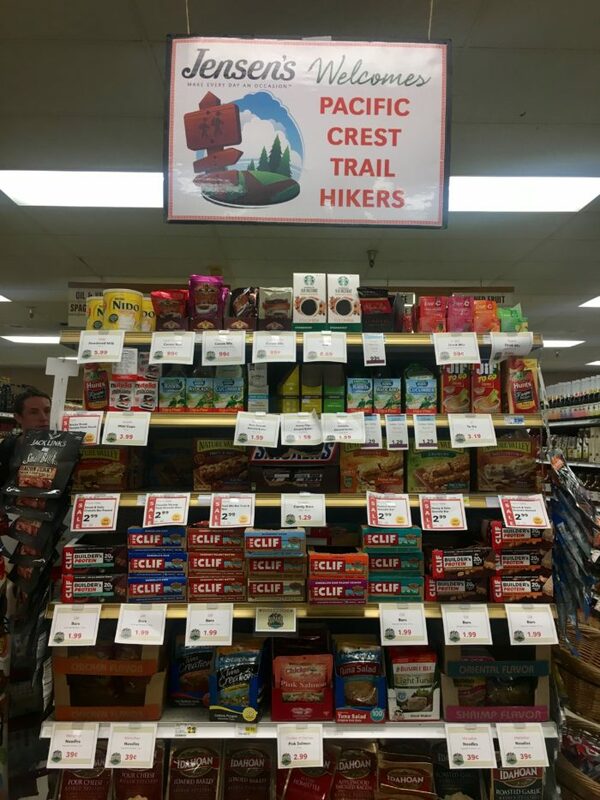 They know these are a hiker staple and keep them in stock. Keep an eye out for the tuna packed in oil for the best calorie-to-weight ratio. In town: Empty the couscous into a Ziplock bag and leave the tuna in the foil packaging. On trail: Add the couscous and tuna into boiling water and let sit for a couple of minutes, then stir. While taking a zero in Wrightwood and cooking a Tex-Mex meal for my trail family, I discovered Mahatma brand rice and beans: an instant, pre-packaged version of the classic. The verdict: delicious! I starting taking these onto the trail whenever I could find them. They were generally available in grocery stores but not convenience stores. In town: Empty the rice and bean mixture into a ziplock bag and leave the avocado whole, packing it safely in a soft spot in your pack near the top. On trail: Add the rice and bean mixture to boiling water and let sit for ten minutes, stirring at the end. Use your knife to dice the avocado, then add to your rice mixture once it is fully rehydrated. I’m not sure it gets much more classic hiker trash then this: two food staples coming together into one of the most common meals you’ll see on trail. In town: This one’s easy. Leave the ramen and tuna in their packaging. On trail: Add the ramen and tuna to boiling water, let sit for a couple of minutes. When we placed an online food order, we often included some Harmony House brand dehydrated vegetables, then would add these to our meals. I was sometimes able to find instant vegetable soup mix in larger grocery stores, that I used in place of dehydrated vegetables. Knorr Pasta Sides are a hiker staple and you can find them nearly everywhere. In town: Repackage the Pasta Sides into a Ziplock bag. Getting the trend here? On trail: Add the vegetables and pasta to boiling water and let sit for about 10 minutes. If you’re feeling extra fancy you can quickly reheat the mixture at the end—it helps the sauce thicken to something resembling more of a sauce then soup. In town: Repackage the potatoes into a Ziplock bag, leave the tuna in its foil packet. On trail: Add the potatoes into the boiling water and stir until all of the powdered potatoes have been mixed with the water, then add the tuna. This meal is ready to eat nearly instantly. 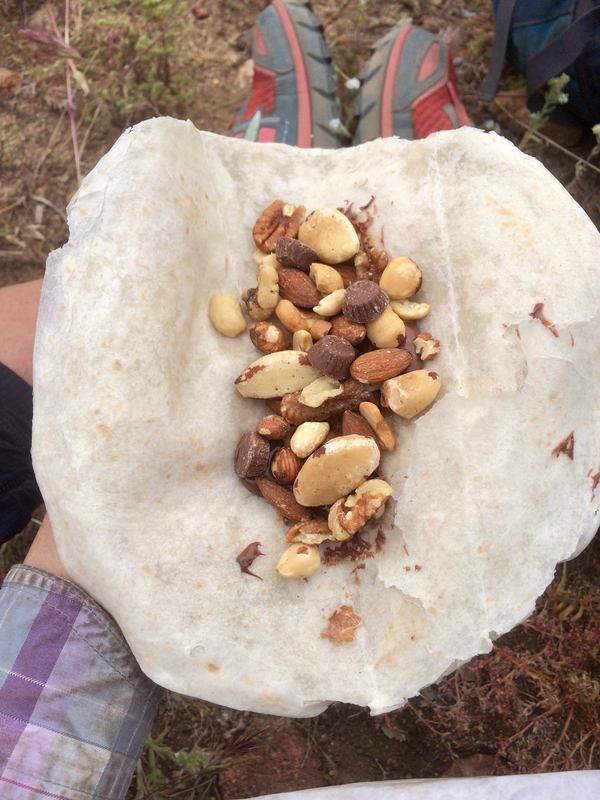 Tortillas are a staple of long-distance trails, you’ll rarely see a hiker leave town without a pack. They don’t necessarily offer the best ratio of calories to weight, but I found that they helped to satiate the craving for fresh-tasting food. Plus, the variety of potential fillings keeps things interesting. Keep this combination interesting by looking for different flavours of the foil packaged tuna; the spicy buffalo flavoured and deli style were my personal favourites. Simply empty the package of tuna onto the tortilla and top with crushed potato chips. Used your spork to spread a big glob of peanut butter onto the tortilla, then squeeze a packet of honey over top. Spread Nutella over the tortilla and add a handful of trail mix. Slice some cheese onto your tortilla and then add either pre-sliced pepperoni or a couple slices of summer sausage. The famous Nutella and trail mix combo; best enjoyed on the side of the trail. Bookmarking! My hiking diet consists of 1) tuna 2) tuna 3) tuna 4) also tuna. Some great ideas to mix it up! Thanks Anna, glad you found it helpful! Awesome trail recipes, I never thought of adding spinach to anything – Great idea! Thanks! This is one of my favourite tricks!